San Diego State Aztecs running back Donnel Pumphrey now holds the record for most career rushing yards in FBS history. After four years with the San Diego State Aztecs, running back Donnel Pumphrey is officially the leading rusher over the course of an entire college career in FBS history. Heading into Saturday’s Las Vegas Bowl against the Houston Cougars, the talented Aztecs running back was just 108 rushing yards away from breaking Ron Dayne’s career FBS rushing record. It may have taken until the second half of Saturday’s game, but Pumphrey was eventually able to break the record. Heading into the Las Vegas Bowl, Pumphrey had already run for 2,018 yards and 16 touchdowns this season. He has been the focal point of San Diego State’s offense all year, helping them going into their bowl game with a respectable 10-3 record. Getting the FBS career rushing record wasn’t easy, especially going against a talented Houston defense that was top-three in yards per rush (2.9) and rushing yards per game allowed (97.9) in the nation. Still, Pumphrey was able to pick up 58 yards in the first half on 13 carries. Here’s a video of Pumphrey’s record-breaking run from the fourth quarter below. After such an incredible college career, Pumphrey will likely have his sights set on the NFL draft after this bowl game. He’s definitely an elusive and speedy threat, but some scouts will be concerned about his heavy college workload, especially since he is just 5-foot-9 and 180 pounds. 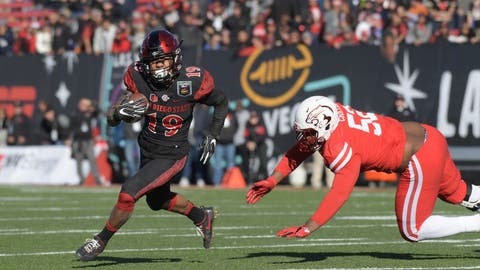 Regardless of what the future holds for the talented Aztecs running back, he can leave San Diego State as one of the greatest running backs in college football history.